SkyOak has collaborated with WisdomTree1—an industry leader and ETF pioneer—to bring to SkyOak's Advisors Modern Alpha core ETF model portfolios that are designed to provide the outperformance potential of active investments with the structural advantages of ETFs. This range of globally allocated open architecture ETF models leverage WisdomTree and third-party ETFs including various allocations to WisdomTree's Modern Alpha ETFs, as more fully described below. They are designed to meet growth, income and wealth preservation needs—and cover a broad range of risk profiles and investment objectives. In June 2006, WisdomTree launched with a big idea and an impressive mission—to create a better way to invest. WisdomTree believes investors shouldn’t have to choose between cost efficiency and performance potential, so they developed the first family of ETFs designed to deliver both. The strategies combine the outperformance potential of active management with the benefits of passive management to create ETFs built for performance. WisdomTree has launched many first-to-market ETFs and pioneered alternative weighting methods commonly referred to as “smart beta.” But their ETFs are not beta, smart or otherwise—they are an investment innovation they call “Modern Alpha™”. * Ordinary brokerage fees may apply. The majority of ETFs are market cap weighted—meaning they give more weight to companies selling at higher prices than those offering stronger fundamentals. But stock prices can—and do—deviate from their underlying value for many reasons. WisdomTree believes fundamentals such as dividends or earnings offer more objective measures of a company’s health, value and profitability than stock price alone. They use proprietary weighting methodologies designed to help magnify the effect these fundamentals have on risk and return characteristics in order to create ETFs built to perform. 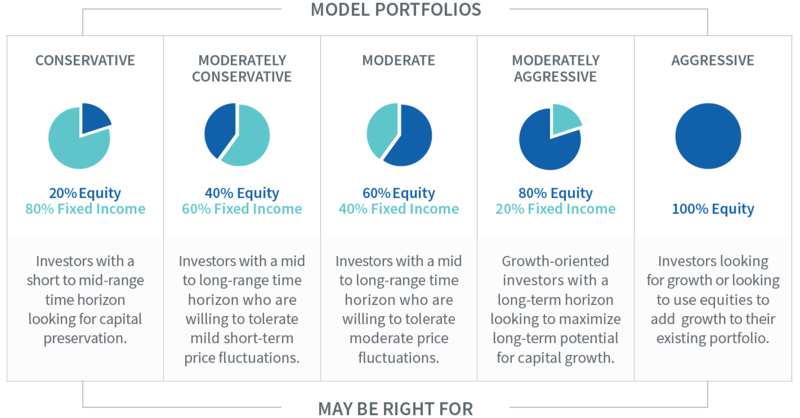 WisdomTree's Modern Alpha ETFs serve as building blocks for WisdomTree's Modern Alpha model portfolio framework, which combines the performance potential of active approaches with the discipline of passive methods. 1) SkyOak and WisdomTree engage in periodic informational discussions regarding WisdomTree model portfolios and SkyOak's general investment philosophies used by SkyOak in providing advice to SkyOak's clients. WisdomTree is under no obligation -- contractual or otherwise -- to take any action related to such informational meetings. SkyOak is solely responsible for making investment recommendations to its clients. WisdomTree is not acting in an investment advisory, fiduciary or quasi-fiduciary capacity to SkyOak or any SkyOak client and no WisdomTree model portfolio is tailored to the circumstances of any individual financial advisor or its individual client. Please see the Important Information section related to the licensing relationship between SkyOak and WisdomTree and other important disclosures. This content is for information only and is not intended to provide, and should not be relied on for, tax, legal, accounting, investment or financial planning advice by WisdomTree Asset Management, Inc. (“WisdomTree”), nor should it be considered or relied upon as a recommendation by WisdomTree regarding the use or suitability of any model portfolio or any particular security. This website discussion of a WisdomTree model portfolio is intended for use only by a financial advisor, such as SkyOak and its representatives, as a resource in the development of a portfolio for a financial advisor's clients. The financial advisor is solely responsible for making investment recommendations and/or decisions with respect to its clients without input from WisdomTree, including with respect to investing in accordance with any model portfolio or any particular security. WisdomTree is not acting in an investment advisory, fiduciary or quasi-fiduciary capacity to any financial advisor or its client and is not providing individualized investment advice to any financial advisor or its client based on or tailored to the circumstances of any individual financial advisor or its individual client. This material has been prepared without regard to the individual financial circumstances and objectives of any investor, and the appropriateness of a particular investment or strategy will depend on an investor’s individual circumstances and objectives. Investors and their advisors should consider the investors’ individual financial circumstances, investment time frame, risk tolerance level and investment goals. Investors should consult with their own advisors before engaging in any transaction. Using an asset allocation strategy does not ensure a profit or protect against loss, and diversification does not eliminate the risk of experiencing investment losses. There is no assurance that investing in accordance with a model portfolio’s allocations will provide positive performance over any period. The model portfolios are provided “as-is,” without any warranty of any kind, express or implied. Information and other marketing materials provided to you by WisdomTree or any third party concerning a WisdomTree model portfolio, including allocations, performance and other characteristics, may not be indicative of an investor’s actual experience from an account managed in accordance with a model portfolio’s strategy. ‍Investors and their advisors should consider the investment objectives, risks, charges and expenses of the ETFs underlying any model portfolio carefully before investing. A prospectus containing this and other information is available by calling 866.909.9473, or click here with respect to WisdomTree ETFs or call the number of the ETF sponsor listed on the back of a non-WisdomTree Funds’ prospectus. WisdomTree Asset Management, Inc. does not endorse and is not responsible for or liable for any content or other materials made available by other ETF sponsors. Investors should read the prospectus carefully before investing. ‍You cannot invest directly in an index or model portfolio. The model portfolios are not funds or investments. The model portfolios are provided for informational purposes only and do not represent any actual account or the results of any actual trading. The model portfolios should not be construed as investment advice. There are risks associated with investing, including possible loss of principal. Foreign investing involves currency, political and economic risk. Funds focusing on a single country, sector and/or funds that emphasize investments in smaller companies may experience greater price volatility. Investments in emerging markets, real estate, currency, fixed income and alternative investments include additional risks. Dividends are not guaranteed, and a company currently paying dividends may cease paying dividends at any time. Diversification does not eliminate the risk of experiencing investment losses. Due to the investment strategy of certain Funds, they may make higher capital gain distributions than other ETFs. Please see prospectus for discussion of risks. This information is provided under a model portfolio licensing relationship only between WisdomTree and SkyOak. WisdomTree is not providing any investment management or advisory services to SkyOak, any financial advisors or their affiliates. Pursuant to the licensing relationship, SkyOak receive investment ideas from WisdomTree in the form of one or more model portfolios. The information is designed to be utilized by SkyOak and its representatives solely as a resource, along with other potential sources SkyOak or its representatives consider, in SkyOak providing advisory and/or management services to SkyOak’s clients. WisdomTree is not responsible for determining the securities to be purchased, held and/or sold for SkyOak client accounts. © 2019 WisdomTree Investments, Inc.